Vampire Weekend are currently warming up for their summer tour, playing some intimate shows around England. A few days ago, they played their new Father Of The Bride single “Big Blue” live for the first time. Yesterday, the band debuted a new cover of Paul Simon’s One-Trick Pony cut “Late In The Evening” at a brunch-time show. They also covered Bruce Springsteen’s “I’m Goin’ Down” and, for the first time in ten years, Fleetwood Mac’s “Everywhere.” Guests were also treated to three rounds of Vampire Weekend’s classic “A-Punk.” The song has become somewhat of a meme, as the near-ubiquitous first track on people’s phones and mp3 players. Vampire Weekend started playing it thrice at Lollapalooza last year. 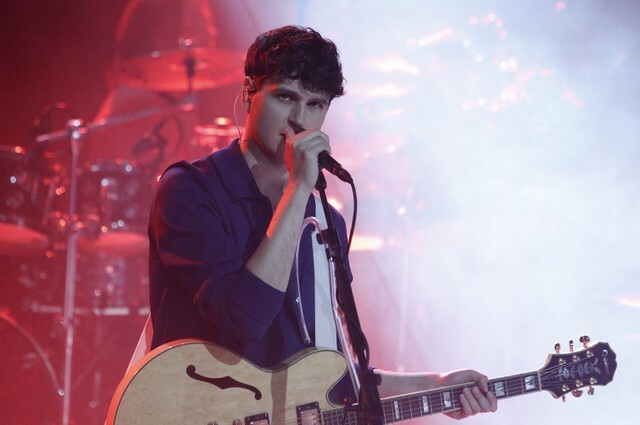 Watch Vampire Weekend cover Paul Simon’s “Late In The Evening” below.